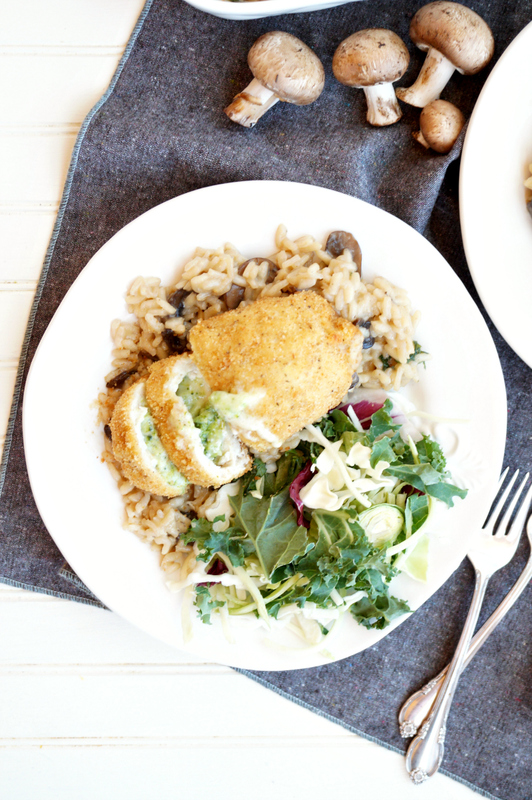 Spice up any weeknight meal with this delicious Creamy Parmesan Mushroom Risotto! 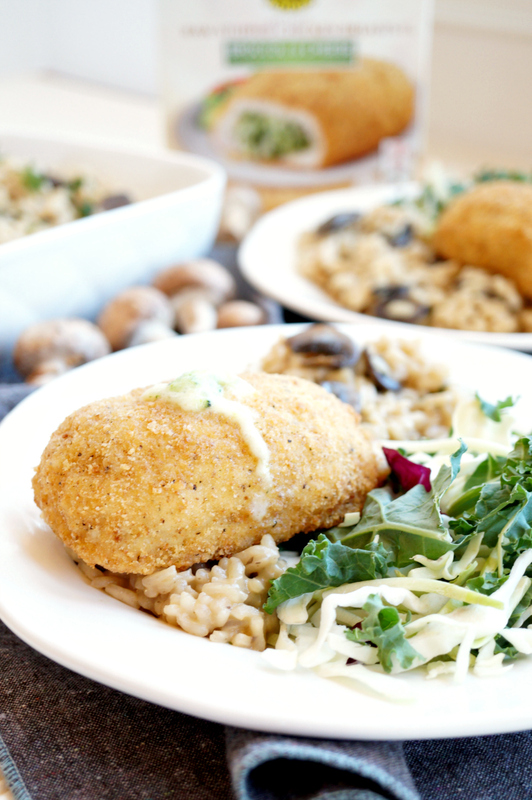 This comforting dish is perfect as a side for Barber Foods stuffed chicken, but works just as well for a vegetarian main. Hello, my dearest readers! So how did everyone fare on Valentine’s Day? Did you get flowers, jewelry, chocolates? I hope, if anything, y’all at least got chocolate. That’s the best part. 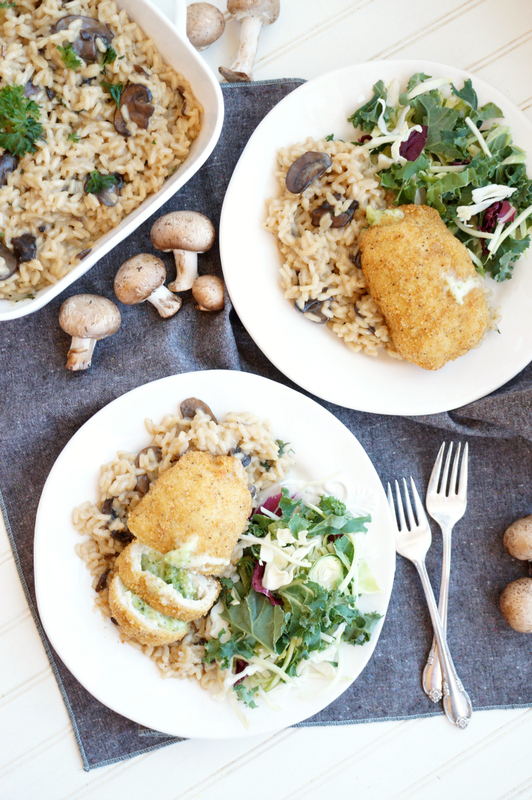 😉 We are returning to the weeknight dinner routine over here, and I’m so happy to have paired up with Barber Foods once again! You may remember them from a few months ago when I whipped up this awesome Loaded Mashed Cauliflower Casserole. Today, I’m sharing this fabulous Creamy Parmesan Mushroom Risotto, which is the perfect side for any meats, or even great all by itself as a vegetarian main. Let’s get cooking! Last time I tried out Barber Food’s classic cordon bleu, which is chicken breast stuffed with ham and cheese. This time, I went for their broccoli cheese variety, which has broccoli florets and a blend of cheeses! To be honest, I don’t think I can pick a favorite because they’re both SO good. Something I really love about this product is that it comes out so crispy! I’m always hesitant about buying breaded frozen foods, but these have been crunchy and delicious every time. Score! 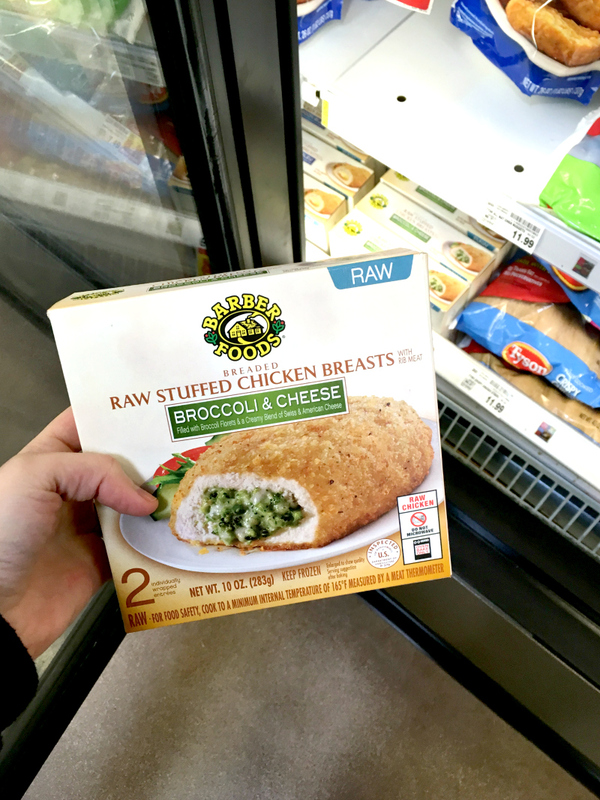 You can find Barber Foods stuffed chicken breasts in the freezer section next to the other breaded chicken products. I bought mine at Kroger, but they’re sold in many different locations! Use their Store Locator to find your closest retailer. Being Italian, of course risotto is totally a staple in my household! I know for a fact that we eat this in some way, shape, or form at LEAST 2-3 times a month. It was only fitting to pair it with Barber Foods chicken! I will say that coming up with a side dish for the broccoli-stuffed chicken breast was a little trickier because broccoli is my go-to veggie. I wanted to challenge myself and NOT use the same veg both inside and outside my chicken. 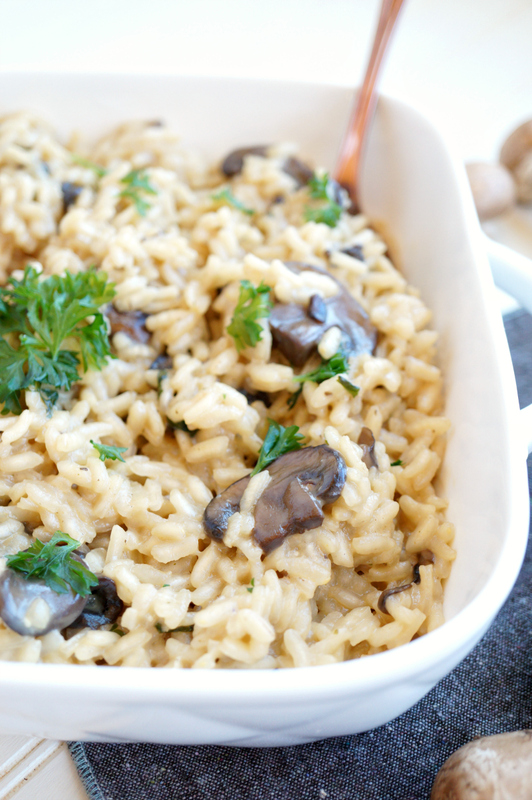 😉 I chose to do a creamy parmesan mushroom risotto, but if mushrooms are not your thing, it’s delicious as a plain risotto or even with different veggies. You can use spinach, asparagus, leeks, or even add a swirl of tomato sauce for a hybrid between pasta and risotto. This recipe is really so versatile! Not to be an enabler or anything but… if you have any leftover risotto tonight, you can always make these Crispy Risotto Cakes as a side dish for tomorrow! 😉 Be sure to add Barber Foods to your weeknight dinner rotation soon, and don’t forget the COUPONS! Happy cooking! First, preheat oven to 375F, and line a baking sheet with foil. Unwrap Barber Foods chicken breasts, and place on the prepared sheet 2 inches apart from each other. When oven is ready, bake for 36-39 minutes. While the chicken bakes, prepare the risotto. Mix the chicken broth and water in a medium pot, set on high heat until boiling, then lower to a simmer and just keep it hot. You will need it soon! In a large nonstick pot, heat the olive oil and garlic cloves over medium-high heat. Cook until fragrant and lightly toasted, then add in the mushrooms. Add in the chicken bouillon cube or season with salt and pepper as desired. Add in ¼ cup of the white wine, and let it cook off and evaporate until it no longer smells like alcohol. Add in the arborio rice, and stir so it's evenly coated with the olive oil and veggie mixture. Let it toast for 1-2 minutes, then add in the remaining ½ cup of white wine, and let it cook off once again. Now, grab a ladle, and start adding in the warm chicken broth we heated earlier. Start with 3-4 ladlefuls, stirring vigorously, then continue adding the rest one ladle at a time as the risotto absorbs the liquid. Keep adding the liquids until risotto is creamy and tender to the taste (no crunch!) without being overly mushy. 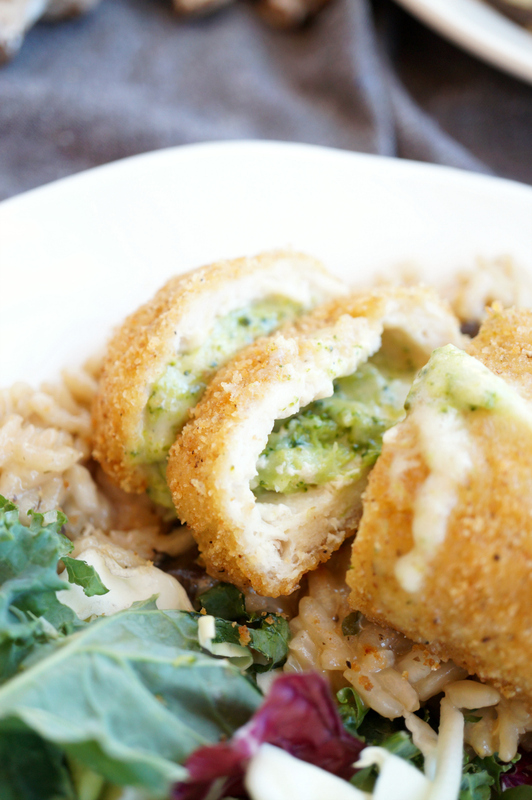 Serve immediately with the Barber Foods broccoli & cheese chicken! 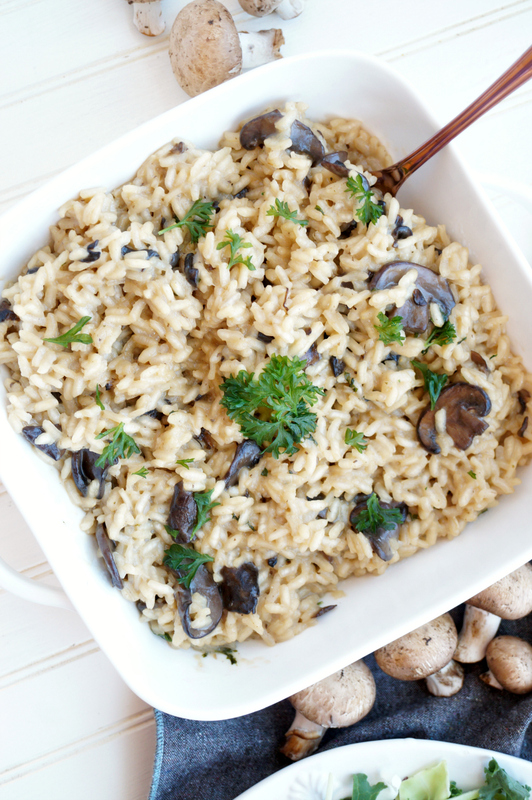 Mushroom risotto is one of my favorite. It’s simple yet always hearty, earthy and delicious.